Tourism Malaysia's Director General Dato Mirza Mohammad Taiyab will visit Seoul on April 18-20, 2010 on a mission to promote his nation's tourism among the local Korean people, announced the Tourism Malaysia Korea Office on April 13. Tourism Malaysia Korea Office's PR & Media Executive Lim Eun said in a telephone interview that Mr. Mirza will arrive in Seoul from Tokyo in the evening of April 18, where he will be attending a Tourism Malaysia promotion, hosted by their Tokyo office. Ms. Lim said that Mr. Mirza's visit to South Korea was decided on the occasion of the 50th anniversary of bilateral diplomatic ties between Malaysia and South Kroea. On Feb. 23, 2010 Malaysia and South Korea marked the 50th anniversary of establishing diplomatic relations. A couple of Tourism Malaysia's officials will accompany Mr. Mirza on his East Asian tour, according to Ms. Lim. Once in Seoul Mr. Mirza will meet with local representatives of tourism agencies, airline companies and tourism-related media officials. He also plans to visit the Korea Tourism Organization (KTO) in downtown Seoul. In particular, Mr. Mirza is scheduled to attend a "Sales Promotion Mission" event to be hosted at The Westin Chosun Hotel in Seoul by Tourism Malaysia Korea Office headed by Director Mohamed Amirul Rizal on April 19, 2010. Malaysian Ambassador to Seoul Dato Ramlan Ibrahim will also take part in the event. Some 200 local tourism-related professionals — tourism agents, airline officials and media officials dealing with tour and travel — will be invited to the dinner reception event. A video presentation of Malaysia will be made at the event in a bid to encourage and promote tourism among the Korean people. Mr. Mirza will leave Seoul and return to Malaysia on April 20, 2010. It was in 1982 that Mr. Mirza started working for Tourism Malaysia. He was appointed director-general in September 2006 three years after he started serving as deputy director general on Dec. 23, 2003. Before joining Tourism Malaysia Mr. Mirza received his degree in business administration and a diploma in tourism administration from UITM (MARA University of Technology). Previously, he was involved in the hotel and hospitality industry, serving as general manager of two premier hotels — the Langkawi Island Resort and Tanjung Jara Beach Hotel. His two overseas assignments were in Frankfurt and Tokyo. Between 1989 and 1990 Mr. Mirza directed the Frankfurt office overseeing promotional projects in Germany, Austria, Italy, and Switzerland. 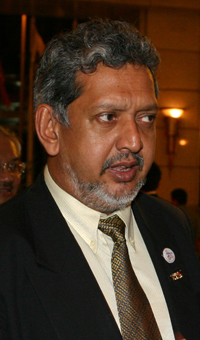 Mr. Mirza served as director of Tourism Malaysia's office in Tokyo from July 1995 to March 2,000. While living a busy life as a tourism official, Mr. Mirza earned his MBA degree from UITM/Ohio University. Mr. Mirza was born in December 1958 in Bagan Serai, Perak. He is married to Puan Zarina Banu bt Mumtaz Ahmad and have three children with her.